Spotlight | Human Heart Nature Natural Body Scrub. After spending the holidays abroad, I came home to a Christmas tree surrounded with presents for Yue and I. Most of them were from friends and family, and some of them from sponsors and brands that I work with or have worked with for the past few years. Unboxing them was such as treat - it still felt like Christmas even though it was almost mid-January. 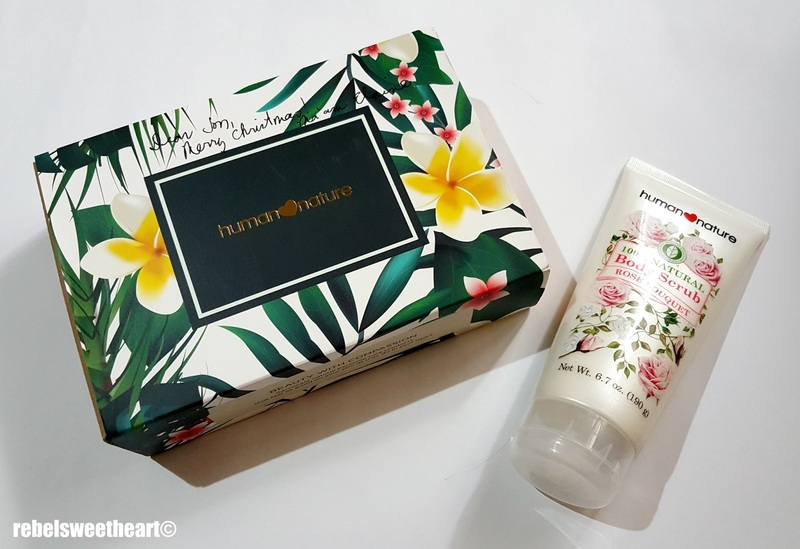 Among these presents was this lovely box from Human Heart Nature Laguna, and inside it was a tube of the Human Heart Nature Rose Bouquet Natural Body Scrub. I usually exfoliate twice a week, but I didn't have the chance to enjoy this luxury while I was in Korea. Taking a bath in negative degree weather can be very challenging - even a pain at times - so I'd bathe as quickly as I could and get my stuff done in the bathroom in the shortest time possible. Hence, I was very excited to give this product a try and take my time in the shower without the fear of getting hypothermia (haha!). Human Heart Nature Natural Body Scrub. 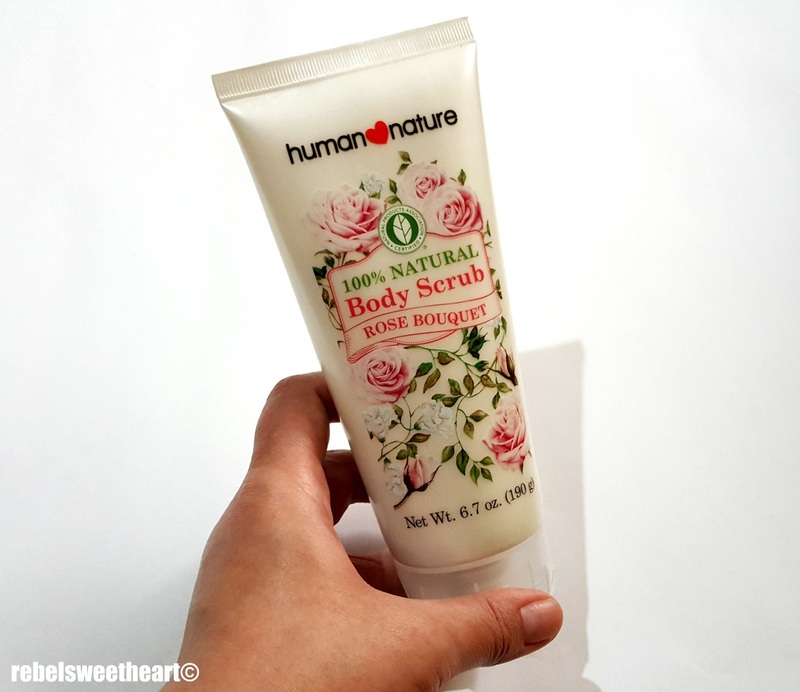 Made with loofah and bamboo scrubs, the Human Heart Nature Natural Body Scrub exfoliates dead skin cells and deep-seated dirt to reveal soft and smooth skin. It also contains aloe vera to refresh and moisturize the skin, and rose oil to increase the skin's permeability. Product description at the back. As you can see, this product is certified by the Natural Products Association, the largest and oldest nonprofit organization in the US which serves as a 'watchdog' of all products that claim to be natural or made with natural ingredients. This includes cosmetics and beauty products, household products, and even food. 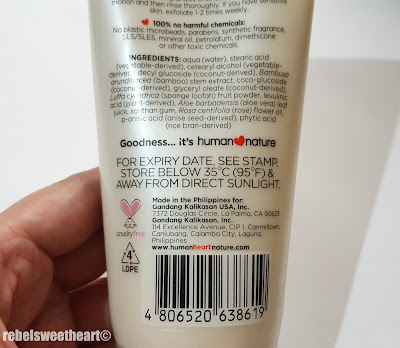 List of ingredients, and the Cruelty-Free logo! To use, simply dispense an ample amount of the body scrub, then massage the fine granules onto damp skin in a circular motion. Rinse thoroughly afterwards. The body scrub has a thick and creamy consistency, with tiny bits of bamboo scrub embedded in it. Each tube contains an ample amount of exfoliant, and you can feel these bamboo bits as soon as you start 'scrubbing'. 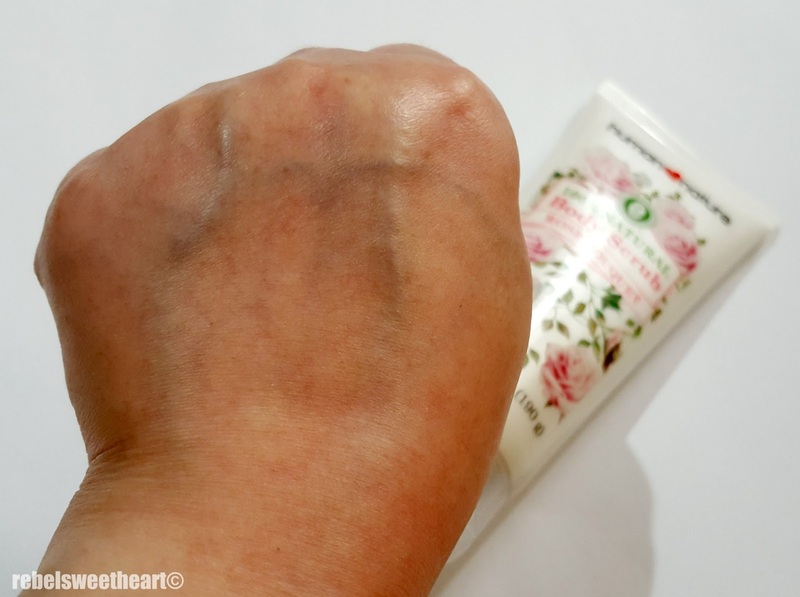 I love how this product leaves my skin soft, smooth, and supple afterwards. Contains tiny bits of bamboo scrubs. The rose scent seemed to be a bit overpowering at first, and for those who are overly sensitive to (floral) scents, they might find that feature a little off. 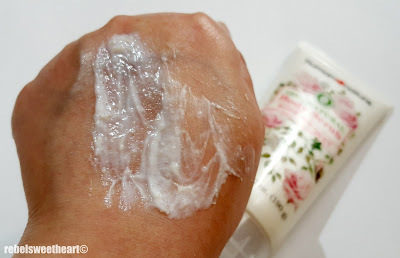 It works just fine for me though, as the scent of roses tend to linger on my skin even long after I'm done bathing. 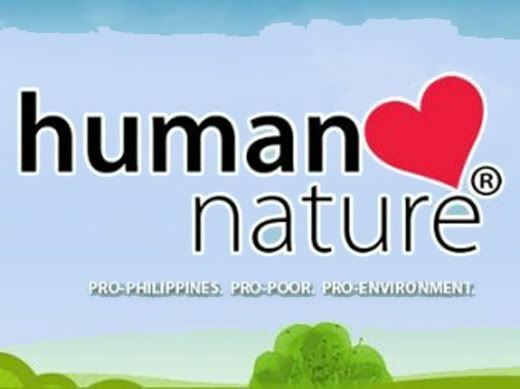 Currently being sold at Php 274.75 for a 190 gram tube, the Human Heart Nature Natural Body Scrub is available at all Human Heart Nature branches nationwide. You can also purchase this product via their online shop, or through me (you can send me a direct message on my Facebook page) since I'm a registered dealer myself. This body scrub is also available in Coffee & Vanilla, which I plan to try as soon as I'm done with this tube! Foodie Goodie | Yoogane Chicken Galbi. Having traveled to Korea thrice, I've tried a variety of Korean food - from instant ramyeon to jjajangmyeon, soups, samgyeopsal, street food, and all sorts of seasoned fried chicken. 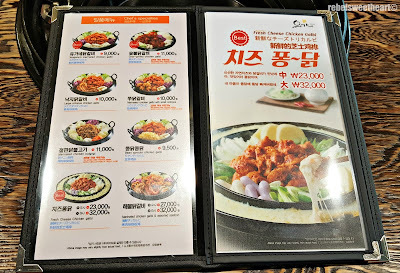 Despite all these, nothing can change the way I feel for dak galbi. I loved it from the first time I tried it in Nami, and I love it even more after dining at Yoogane, one of the most popular and the best chicken galbi restaurants in South Korea. We finally found Yoogane in Myeongdong! 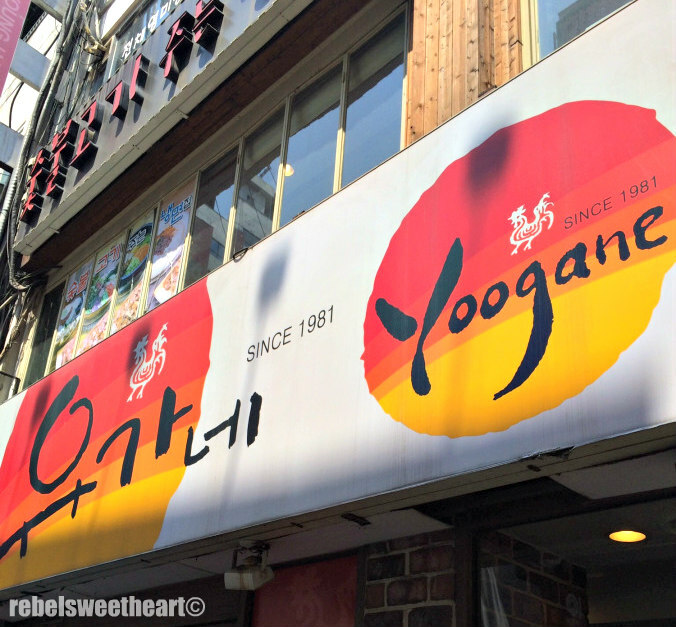 Established in 1981, Yoogane began as a small restaurant in Busan. Despite fierce competition from other dak galbi restaurants, Yoogane was extremely well-received by the residents of Busan. Hence, the restaurant continued to enjoy success, and opened branches in other areas such as Seoul, Incheon, Ulsan, Daegu, Gangwon, and even Jeju Island. In Seoul alone, there are already 29 Yoogane branches with three of those situated in the shopping capital, Myeongdong. Making his way to the third floor! 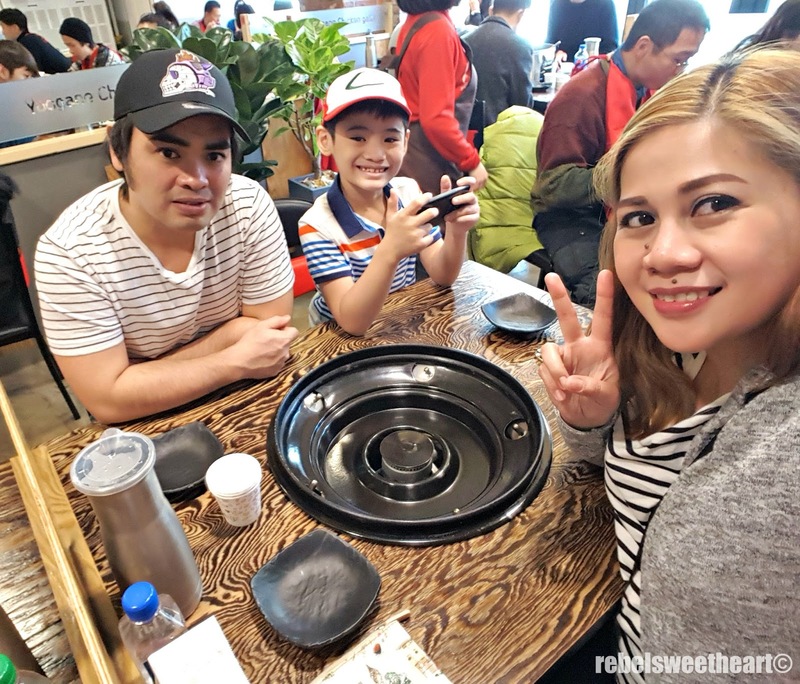 On Christmas Day, my family and I had the chance to visit and dine at the third branch in Myeongdong, located near the Labiotte store and right across Olive Young. 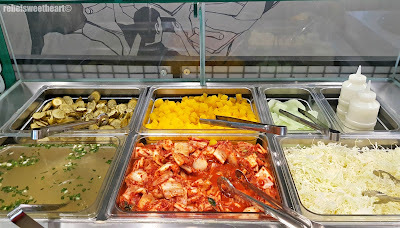 The third branch occupies two floors of the Yu-hwa Building, and both floors are almost always jampacked especially during lunch and dinner time. While waiting for our food to be cooked. As I have mentioned before, dak galbi is a spicy stir-fried dish made with boneless chicken pieces, sweet potato, cabbage, tteok, and other vegetables. 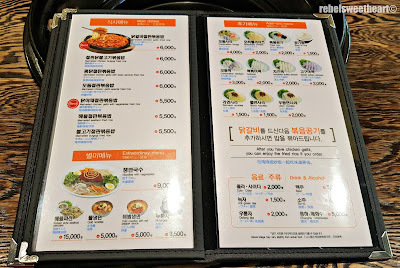 It's Yoogane's signature dish, with eight varieties available on their menu. We ordered the Cheese Chicken Galbi (23000 won, good for sharing), which I had been craving for even when I was still in the Philippines. We also ordered two small bowls of rice (1500 won each) to go with it. 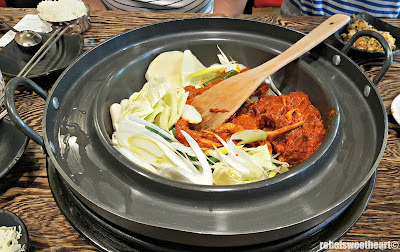 We asked the waitstaff to make it less spicy so that Yue can enjoy the dish with us. But since we were unsure if he could handle the spice, we ordered another dish for him just to be on the safe side. 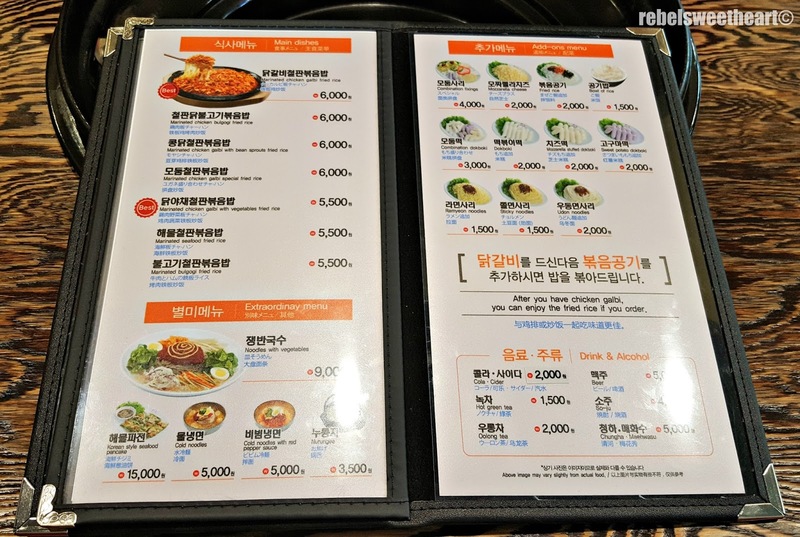 Add-ons, plus other main dishes. 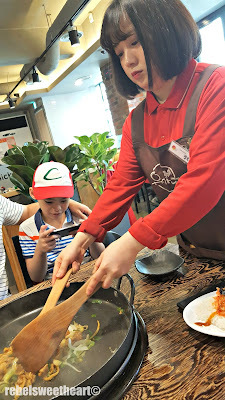 We got him a serving of the Marinated Chicken Bulgogi Fried Rice (6000 won), which the waitstaff cooked first right before our eyes. 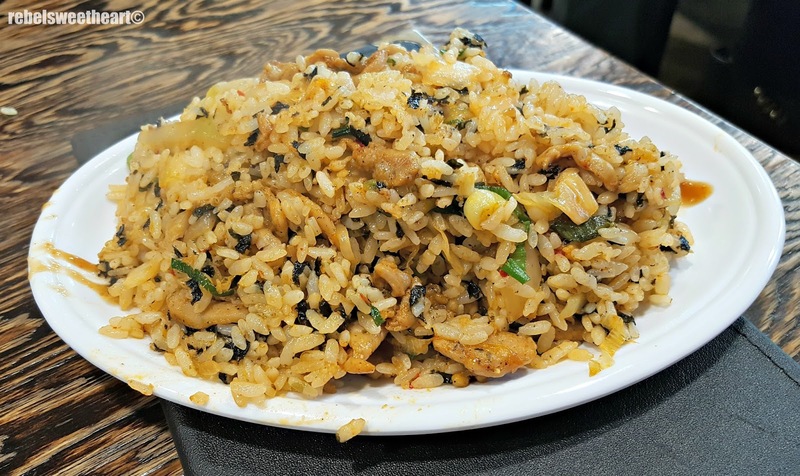 ... stir-fried with small pieces of chicken meat and scallions. Ta-daaa! Marinated Chicken Bulgogi Fried Rice! Once the chicken bulgogi was cooked, the waitstaff took out the pan from the grill and came out a few minutes later with a new pan containing the ingredients for our dak galbi. 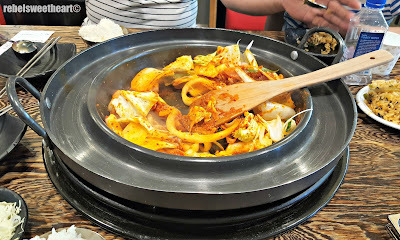 Up next - dak galbi. As we waited for our food to cook, the husband went over to the self-serve station to get side dishes. 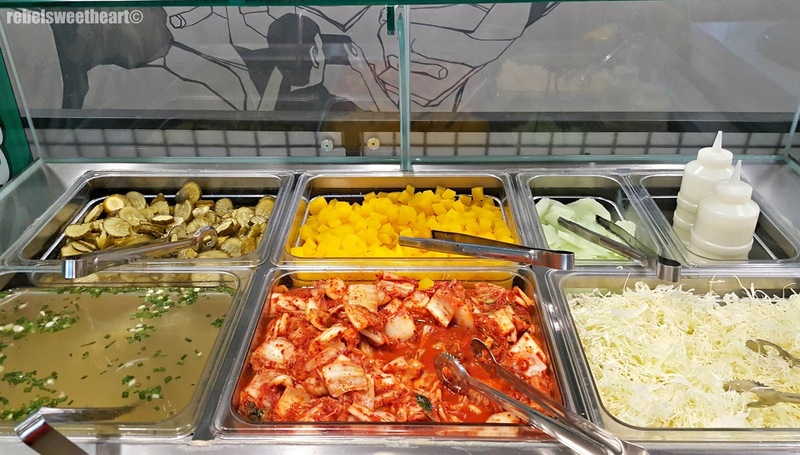 They're free of charge, and you can load up on unlimited amounts of cold soup, shredded cabbage, kimchi, and other fermented vegetables. Back at our table, there's a lot of action happening on the frying pan. Like the other dish that we ordered, the dak galbi was cooked right in front of us, with the waitstaff coming over to our table every three minutes or so to stir-fry the ingredients until they were cooked. Good food being cooked right before our very eyes. Halfway through the cooking came the best part - the cheese! Generous amounts of mozzarella cheese poured on the side pockets of the pan, melted until they became soft and stringy. 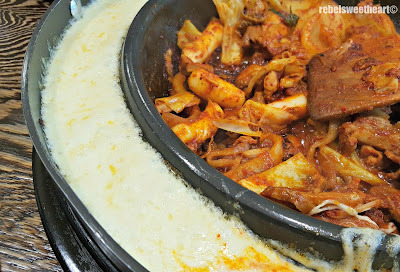 The dak galbi cooks while the cheese melts. 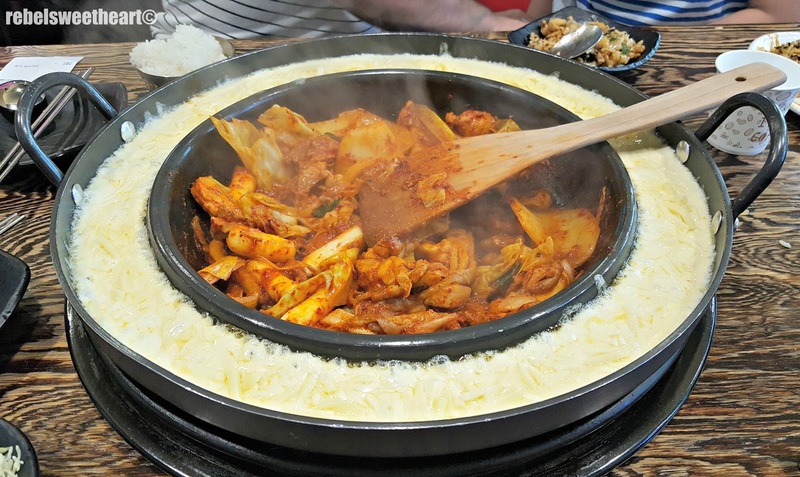 We dug in as soon as the waitstaff turned the stove off, and the cheese-coated dak galbi was so delectable - creamy, flavorful, with just the right spicy kick. 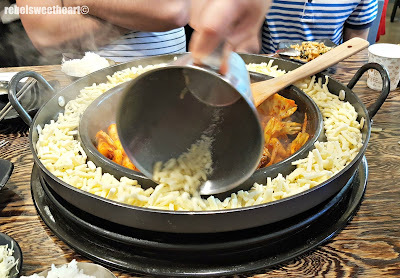 After a few bites, the husband dumped the rice on the pan, and stir-fried it until each grain was evenly coated with the dak galbi sauce. 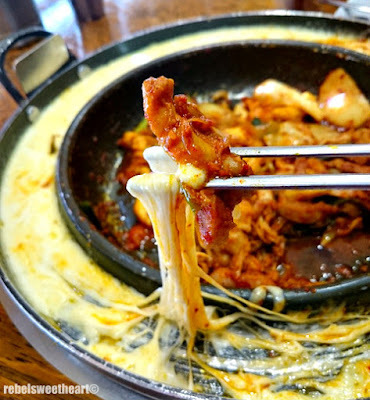 He even added a few strings of cheese for the extra ooomph. And since the food was so good, we didn't give a damn if we packed a few pounds after just one meal, haha! 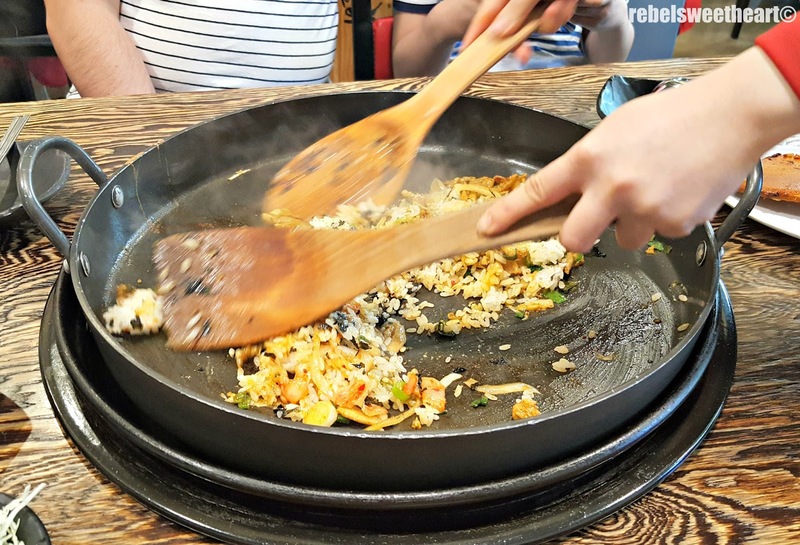 Heck, we didn't even care if our clothes reeked of dak galbi after we ate! 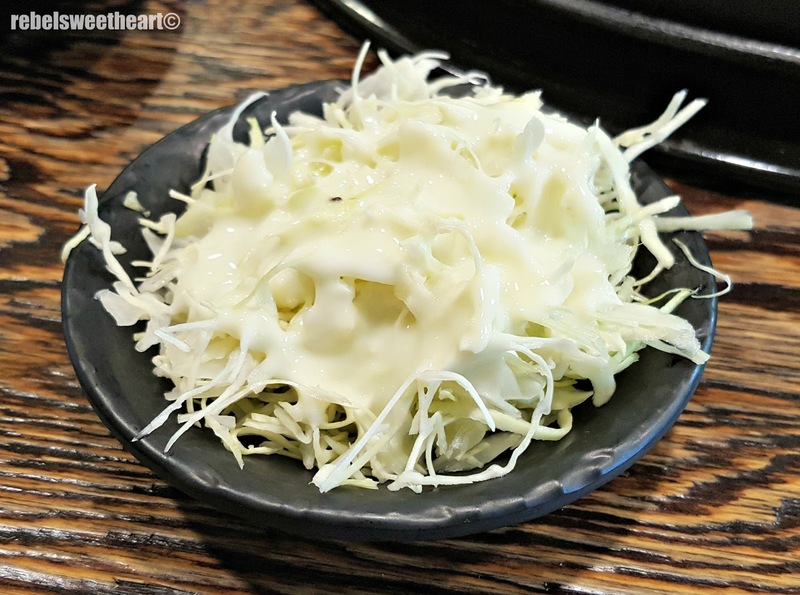 If you're visiting Korea, make it a point to enjoy a meal or two at Yoogane. 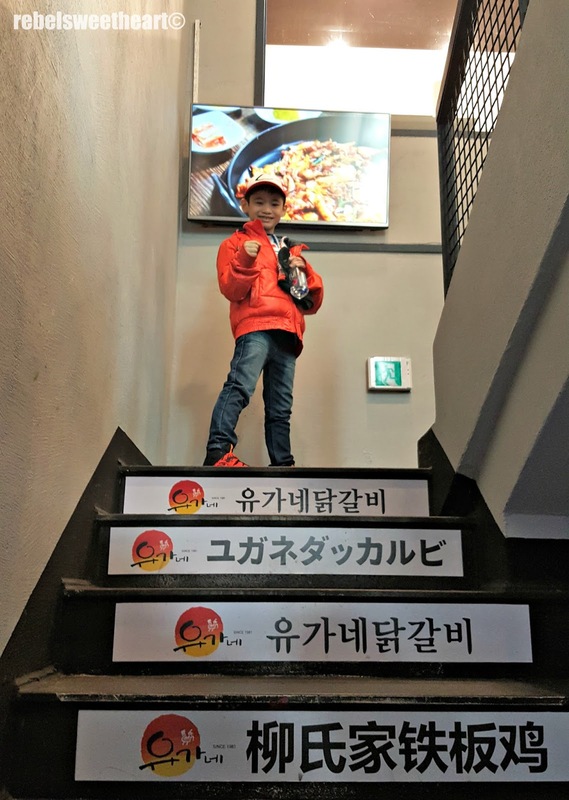 With their numerous branches across the country, you'll be sure to find one in popular tourist areas such as Hongdae, Dongdaemun, Gangnam, and of course, Myeongdong. We're definitely coming back to Yoogane when we return in Spring, and now I'm starting to count the days until I get my chops on this spicy cheesy goodness once again! Pucker Up! | Labiotte Wine Lip Tint. 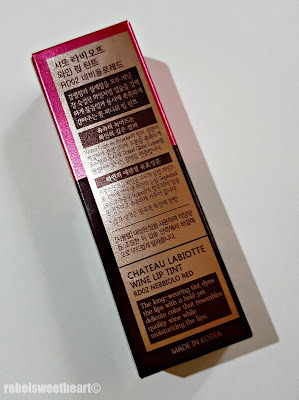 One of the few makeup items that I bought during my most recent trip to Seoul is the Wine Lip Tint from Labiotte. They're all the rage on social media, and the curious cat in me wanted to know what the hype was all about. Pronounced as 'la beauty', this botanic-based cosmetics brand was launched in August 2015 and has become extremely popular since then. The brand even created quite a buzz among Kdrama fans when Kim Go Eun, who then played the role of Seol in 'Cheese in the Trap', was named as its model and endorser. You probably know her now as Ji Eun Tak in the hit TVN drama Goblin. 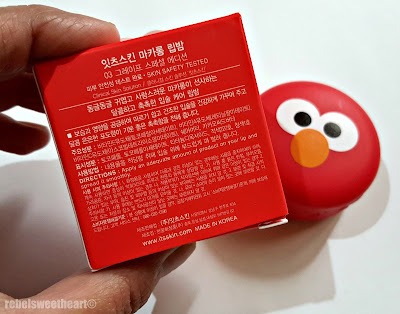 I reckon that the lip tint's packaging is one of the key factors to its huge popularity. As you can see, it comes in a small wine bottle that's both cute and elegant. The box is just as sophisticated, with its embossed prints, shade indicator (the upper portion of the box) and all. at the back of the box is an English print of the product description. Inspired by the delicacy and the intensity of well-aged wine, this long-wearing lip tint dyes the lips while moisturizing it at the same time. 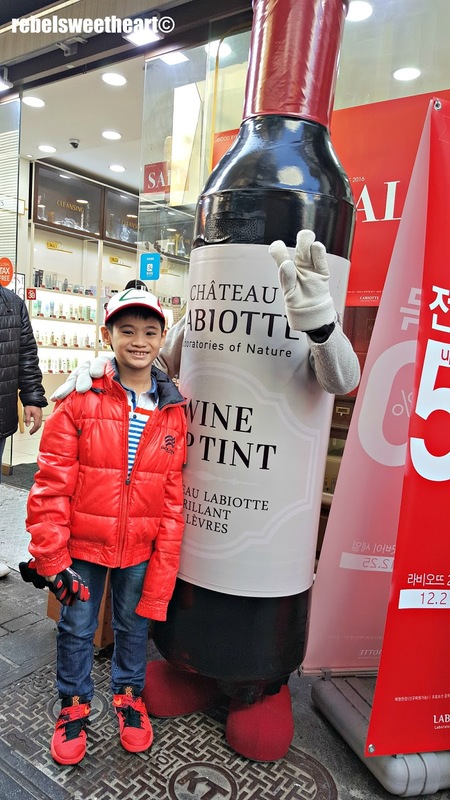 It also contains Sepivinol, a wine extract with antioxidant properties. 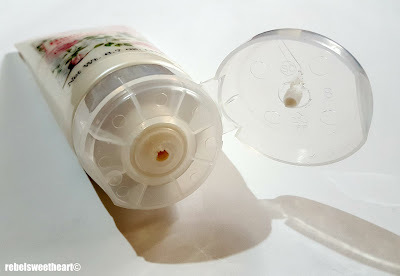 The neck of the bottle twists off, revealing an attached applicator with a slanted doe-foot tip. 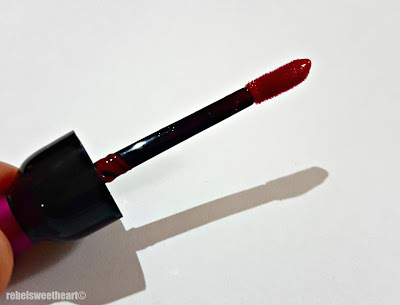 The shape of the applicator actually plays an important role in determining the authenticity of your lip tint. The fake ones that are now circulating in the black market and even online have either flat or rounded doe-foot applicators. I've seen lots of online sellers promoting their Labiotte Wine Lip Tints as 'authentic', yet the prices seem too good to be true. 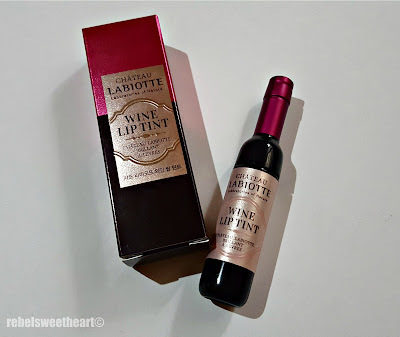 Php 150 for an original Labiotte Wine Lip Tint?! Sounds shady to me. Swatched once on the left, twice on the right. 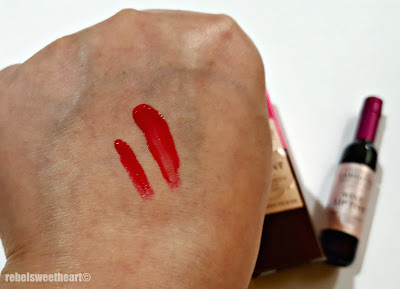 With regards to the texture, this lip tint is thin and watery - but not too watery that you lose control. 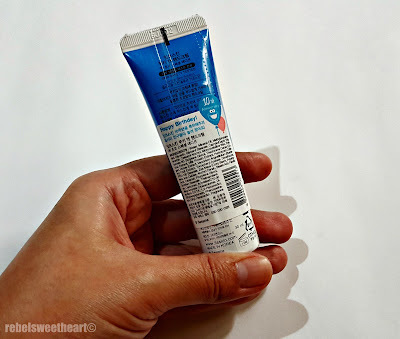 Its formula is fast-drying, moisturizing, buildable, and incredibly long-wearing. 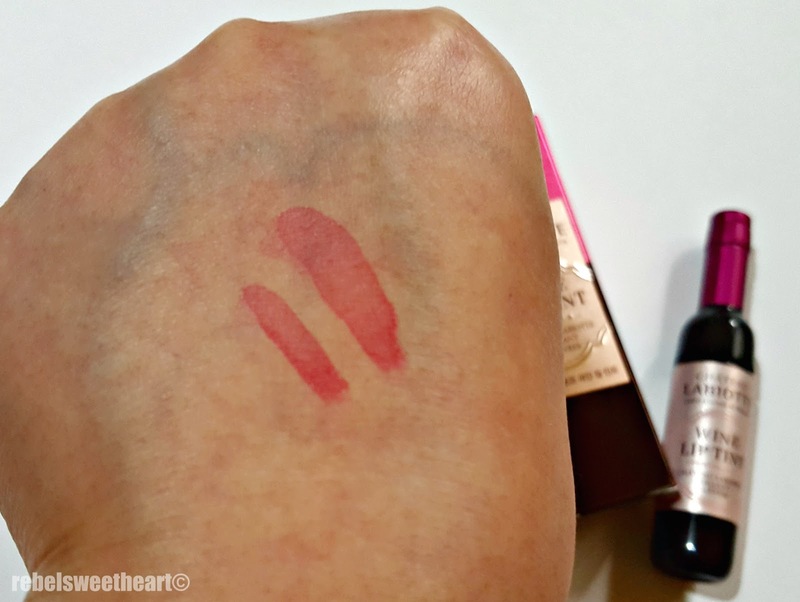 For a lip product that's thin and practically weightless, its longevity is amazing! They stay on your lips for about eight hours, with the color fading just a wee bit when you eat. As for the finish, the shade that I own is semi-opaque. This one is RD 02 Nebbiolo Red, a lovely pinkish red shade with a bit of sheen to it. Nebbiolo Red on my lips. 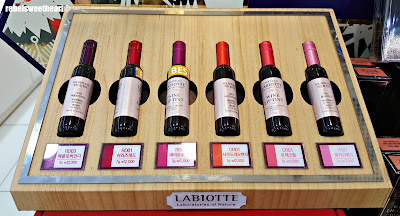 I swatched all six shades of these lip tints while at the Labiotte store in Myeongdong and I was particularly drawn to Nebbiolo Red (the third bottle in the photo below). And it's not only because its cap is purple, which happens to be my favorite color. 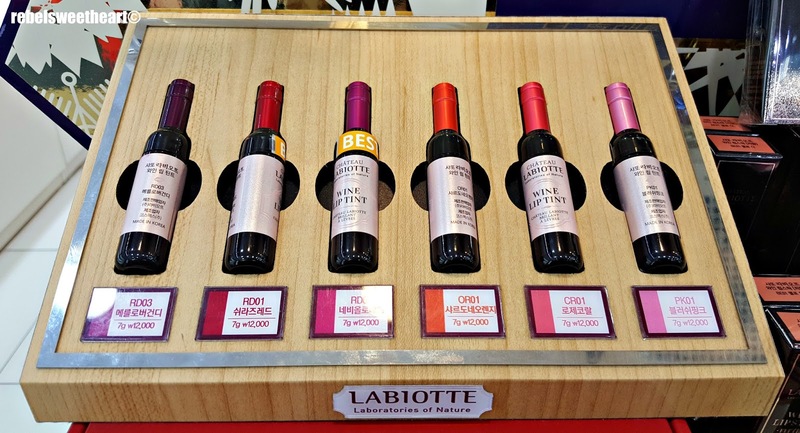 The Wine Lip Tint collection at the Labiotte store in Myeongdong. It's not as crazy pigmented as Chardonnay Orange (fourth bottle) or super opaque as Shiraz Red (second bottle). Yet it's not as sheer as the other three shades - Pink Blush (last bottle), Rose Coral (the bottle next to it), and Merlot Burgundy (first bottle). It's the perfect balance between opaque and sheer, and its color is one that I can wear any day, at any given occasion. 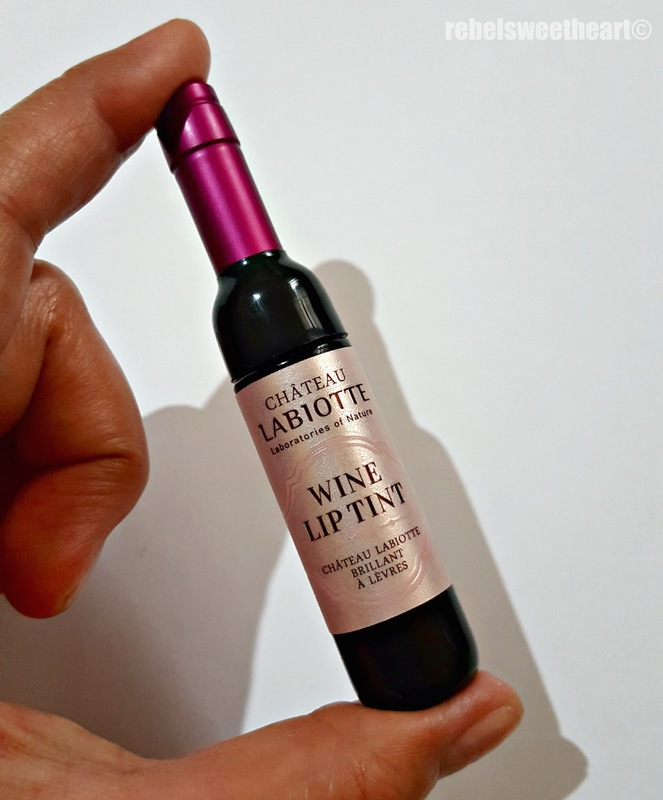 Priced at 12000 won (around Php 500), the Wine Lip Tint is definitely worth the money, and more than just a hype. I got mine at a cheaper price (around 9000 won if I remember correctly), as Labiotte went on sale last winter. I could have bought more, but the boys were already giving me that 'are-you-not-done-yet-we-are-famished' look just as I was moving on to the Wine Lipsticks. Oh well, there's always the next trip (read: Spring)! Missha x Line Friends Magic Cushion in #23. LIPS: Labiotte Wine Lip Tint in Nebbiolo Red. Seoul Searching | My Winter Skin Care Essentials. Winter can wreak havoc on your skin. 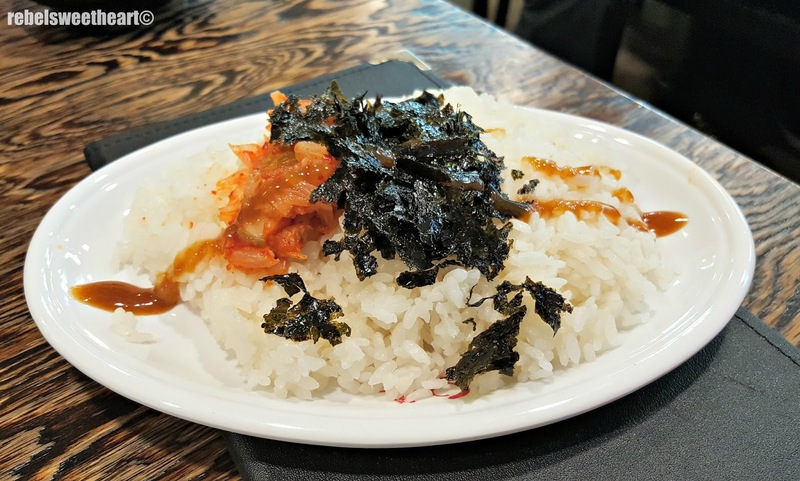 I know that for a fact, as my first-ever trip to Korea happened in the winter of 2015. 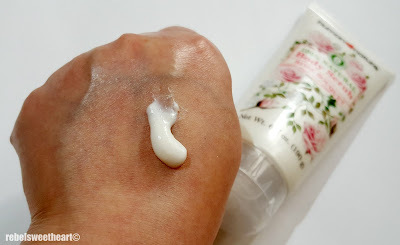 The dryness, the flaking, the itchiness - especially the itchiness! - I know that all too well. 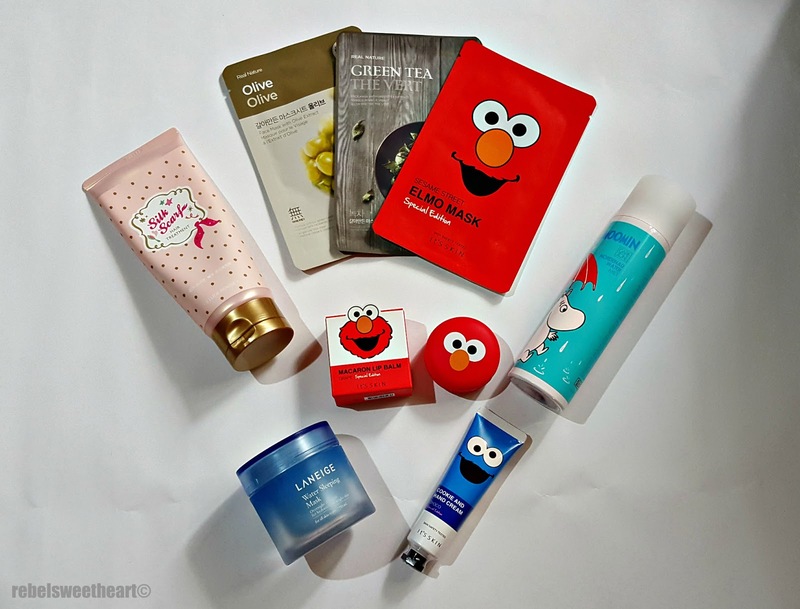 Not wanting to go through any of these discomforts again, I came to Korea last December armed and ready with these winter skincare essentials. Laneige's best-selling product for more than ten years running, the Water Sleeping Mask also happens to be my favorite skincare product of all-time. Packed with ceramides, anti-oxidants, and highly concentrated ionized mineral water, this revolutionary gel-type mask moisturizes and revitalizes the skin overnight. Laneige Water Sleeping Mask, 28000 won. 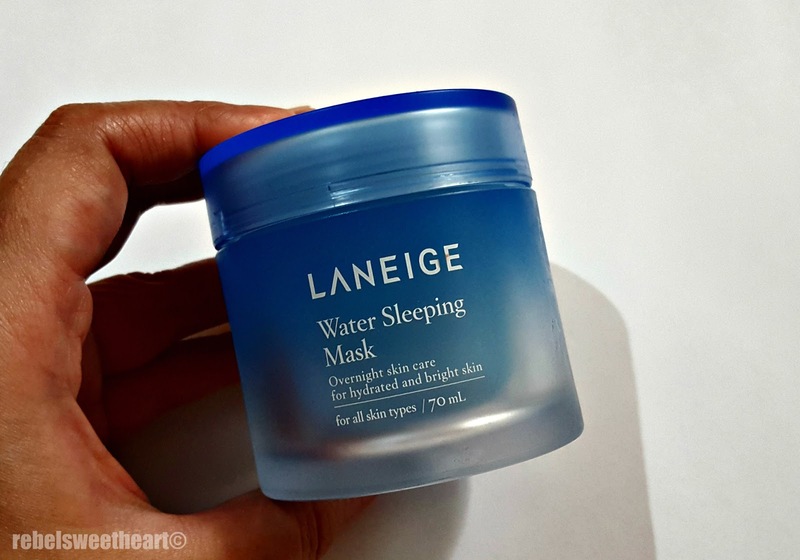 The Laneige Water Sleeping Mask has been part of my skincare regimen for years now. I started using this in 2012 when it was still branded as the Water Sleeping Pack_EX, and has been a staple in my fridge since. (I keep it in the fridge to enhance the cooling effect on my skin.) It feels wonderful waking up to soft, smooth, nicely-hydrated skin - especially in the dead of winter - and this product does exactly that. 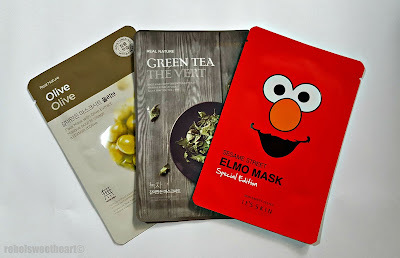 Korean beauty sheet masks have become extremely popular over the years, which comes as no surprise to me. I'm crazy about them myself as they're basically a full-spa treatment in one easy-to-wear sheet. They're affordable, easy to use, and very effective, too. And with almost every Korean beauty brand having their own line (or lines, even) of sheet masks, you're bound to find one that will suit your skin and address your skin issue/s. Most sheet masks go for as cheap as 1000 won each. I chanced upon a huge sheet mask sale at The Face Shop counter in eMart - 20 sheet masks of my choice for half the price, plus I get two Calendula sheet masks for free. What a wonderful way to feed my sheet mask obsession! The Green Tea and Olive variants are my top picks - the former soothes skin irritations while hydrating the skin; the latter provides intense hydration and makes the skin soft, smooth, and glowing. 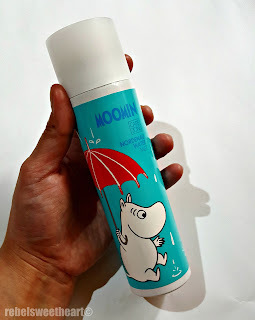 Care Zone Moomin Nordenau Water Mist. 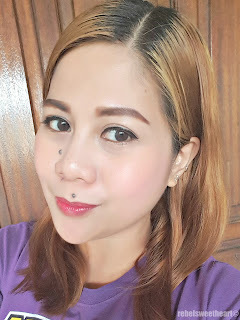 Another skincare product that I can't live without are face mists. If you rummage through my purse at any given time, chances are, you'll find a bottle or a spray can inside stashed together with my asthma inhaler. What the inhaler does for my lungs, the face mist does for my skin. 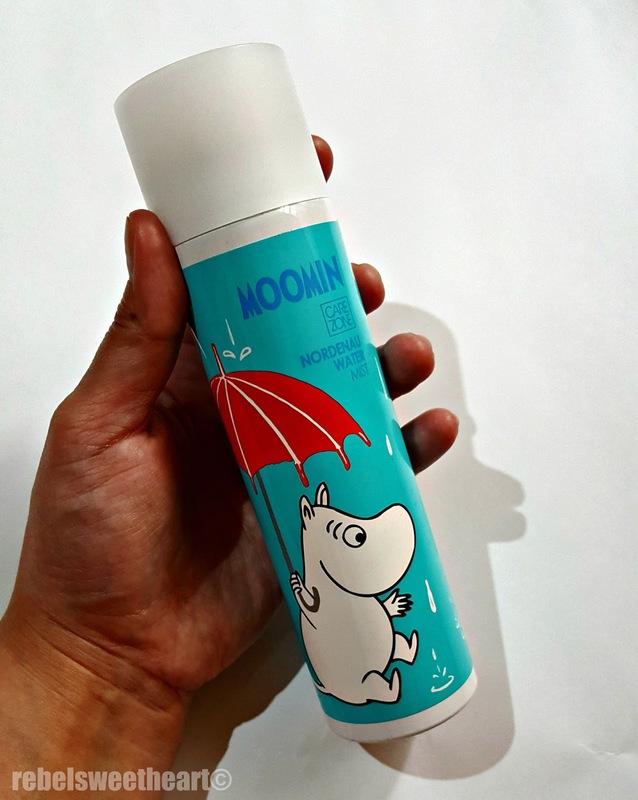 Care Zone Moomin Nordenau Water Mist, 18000 won. It's my on-the-go hydrator, my pick-me-upper whenever my skin feels tight and dry. I can spray it on my face anywhere, at any time of day, and voila - instant hydration without messing my makeup. Super fine nozzle, I love! A product of LG Beauty (yes, the same group that produces mobile phones and household appliances), the Care Zone Moomin Nordenau Water Mist is a mineral-rich water mist that hydrates and soothes skin. This exclusive product line contains Nordenau mineral water from Germany, regarded as one of the world's greatest 'healing waters'. 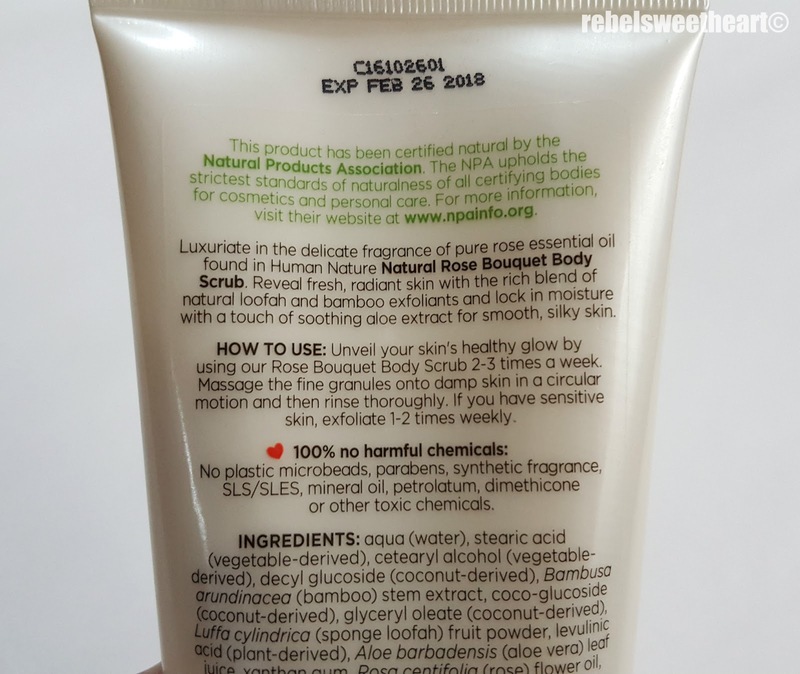 Although I'm skeptical about the 'healing properties', I love its hypoallergenic, paraben-free formula and the fact that it can refresh and hydrate my skin and set my makeup with just a few spritzes. It's Skin Macaron Lip Balm. It's no secret that I'm a sucker for makeup collaborations, all the more if they have uber cute packaging. This special edition Macaron Lip Balm from It's Skin is all that, and much more. 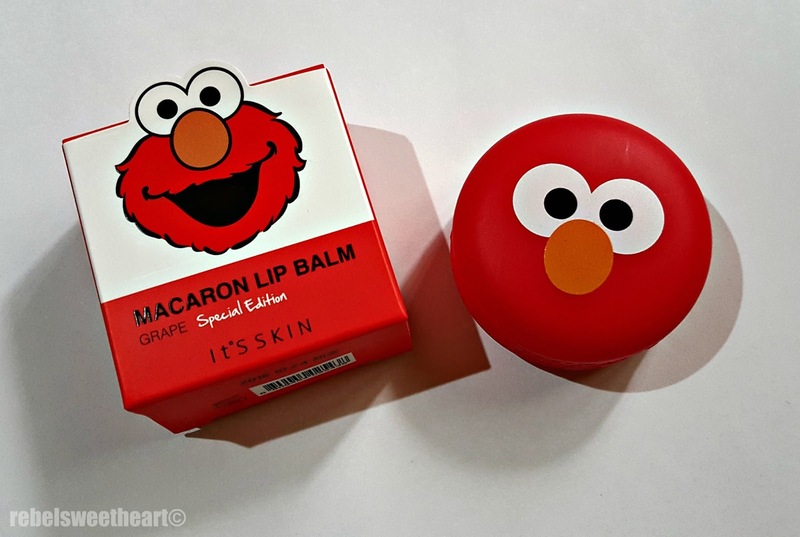 It's Skin x Sesame Street Macaron Lip Balm, 5800 won. The macaron packaging is adorable as it is, what more if it has Elmo (and other Sesame Street characters) printed on it? 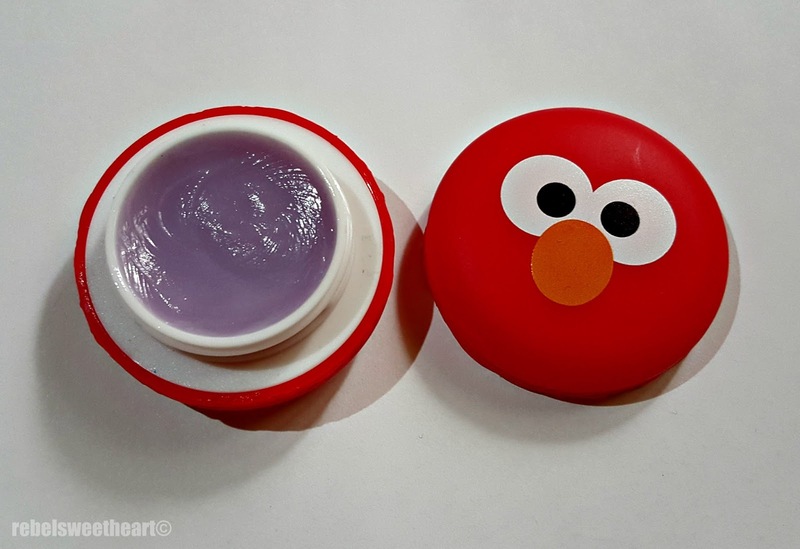 With its sweet grape scent and soft, non-sticky formula, this lip balm was an instant hit for me and my son. It does a good job of keeping my lips moisturized and preventing it from chapping. This collaboration was released in celebration of It's Skin's 10th anniversary. The only downside to this lip balm is that I have to dip my pinkie in each time I use it. It's not very sanitary, but yeah, the packaging really won me over. Haha! It's Skin Cookie and Hand Cream. By now you've probably figured out that I'm a fan of Sesame Street. Is there any kid - particularly those who were born in the 80's - who isn't? 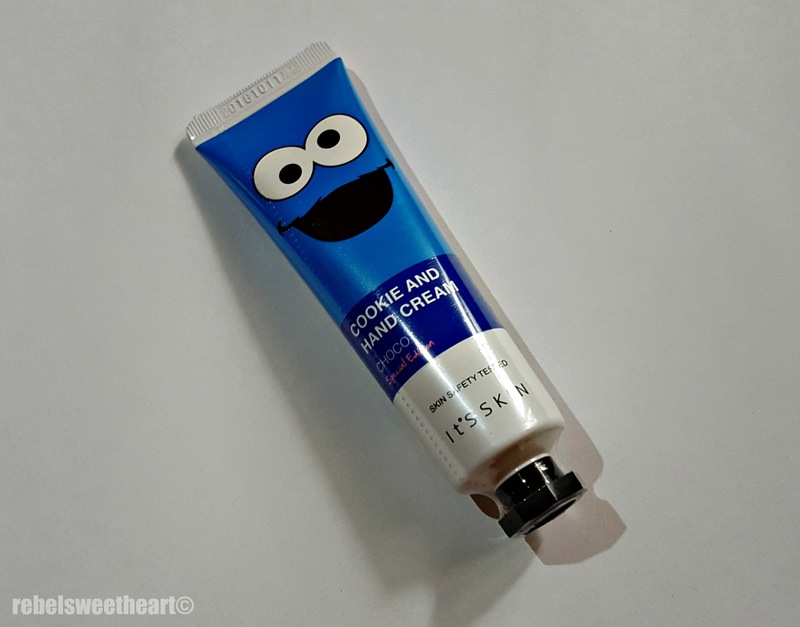 It's Skin x Sesame Street Cookie and Hand Cream, 3000 won. I won't say more about the packaging, because the cuteness speaks for itself. There's the 10th Anniversary sticker at the back of the tube. As for the formulation, I love that this hand cream absorbs easily onto the skin and doesn't feel greasy when applied. 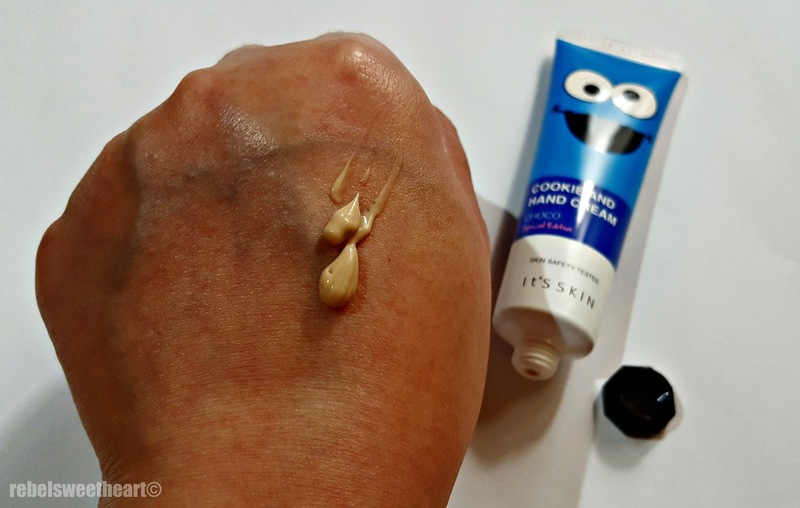 It contains tiny black beads which appear like crushed cookies, hence the name 'Cookie and Hand Cream'. Also, it leaves your hands nice and soft, with a sweet chocolate-y fragrance to boot. This light moisturizing hand cream comes in a sleek and handy 30 mL squeeze tube which can easily fit in your purse and can be brought in-flight if you're traveling. 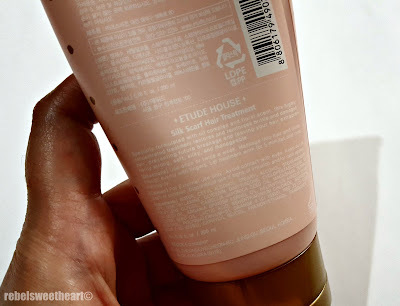 Etude House Silk Scarf Hair Treatment. So here's the thing. I knew that winter can be pretty harsh on the skin and hair. But I had no idea that it could be very unforgiving to bleached hair! Barely 24 hours after I arrived in Seoul, my lovely ash-brown, purple-streaked hair turned into a dry, disheveled mess! Etude House Silk Scarf Hair Treatment, 7000 won. I rushed to the nearest Etude House store and got me a tube of the Silk Scarf Hair Treatment, a full-sized version of the hair treatment that comes with every box of the Bubble Hair Coloring. Specially formulated with oil complex and floral scent, this highly concentrated treatment restores and reinforces damaged hair, and prevents it from becoming dry and brittle. Normally, I would use this at least once a week. While in Korea, I used this every other day, alternating it with my regular conditioner. 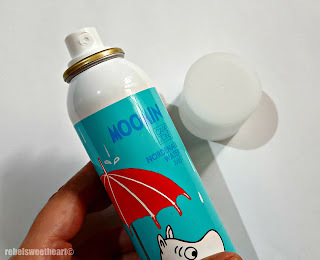 If not for this product, my hair would have been a lifeless blob of blonde! Seoul Searching | Haru & One Day. Hello 2017, Goodbye Baby Teeth!